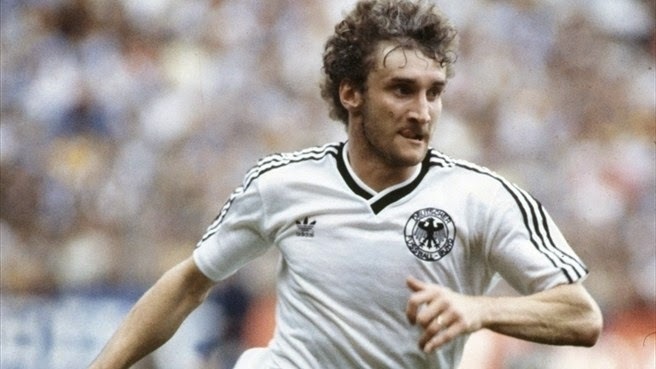 Rudolf "Rudi" Völler, a German striker who was capped for his country 90 times, was instrumental to the German’s squad success during the 1980’s, and the very early 90’s. In his 12 years with the German squad he scored an impressive 47 goals, helping his nation to a World Cup win in 1990, and eventually became Germany’s national team manager in 2000. Völler’s first call-up to the West German squad came in 1982, but he did not travel with the team to the World Cup in Spain that same year. But a year later, Völler was already a part of the West German’s qualifying campaign for the 1984 European Championships. In the qualifying matches Völler scored 5 goals and then 2 more in the final tournament group stages in France, but the Germans did not go through to the later rounds. In 1986 Völler traveled with the West German squad to the World Cup in Mexico, scoring just twice in the qualifying stages. But in the final tournament, Völler would become key to the West German’s great run to the Final. In the first match of the group stage, Germany played against South American side Uruguay, Völler played the full 90 minutes and although he did not get on the score-sheet, the Germans managed a 1-1 draw. In their second match Germany was down 1-0 to Scotland in just the 18th minute, but four minutes after that Völler would score his first World Cup goal and tie the game up. An eventual 2-1 win over Scotland would prove very important, as Germany was not able to score against 3rd group match opponents Denmark and lost 2-0. But the Germans would scrape by to the next round, thanks to that 2-1 victory over the Scots.In the round of 16 Germany would play Morocco. In a match that saw Völler substituted in the 46th minute, Germany struggled to score and got through to the next round thanks to one free-kick goal scored by Lothar Matthäus in the 88th minute. Völler did not play in the quarter-final match at all, but did come on as a substitute in the semi-finals to score West Germany’s second goal, in a 2-0 victory over France. In the final match against eventual winners Argentina, Rudi Völler came on as a substitute again. When Völler stepped onto the pitch in the 46th minute the match was going Argentina’s way. With a goal in the first half, and another 10 minutes after Völler’s addition on the pitch, the Argentines were well on their way to a fairly easy World Cup Finals victory. But in the 74th minute Völler headed a corner-kick delivery towards the goal, where Karl-Heinz Rummenigge was standing and was able to slot the ball to the back of the net and provide the Germans with a lifeline. 7 minutes later Völler was a hero, when a very similar corner-kick situation played itself out, only this time it was Rudi on the doorstep, and he made no mistake slotting the ball past Argentine goalkeeper Nery Pumpido. Argentina would score again before full-time and would be crowned champions of world football, but Rudi Völler has made his mark on a tournament that he and his team would win the next time around. Two years later West Germany hosted the European Championship. Rudi Völler managed to score two goals in the group stages, but the Germans would be eliminated by the eventual champions the Netherlands, in the semi-finals. Leading up to the 1990 World Cup in Italy, Rudi Völler was the top scorer in Germany’s qualifying group. 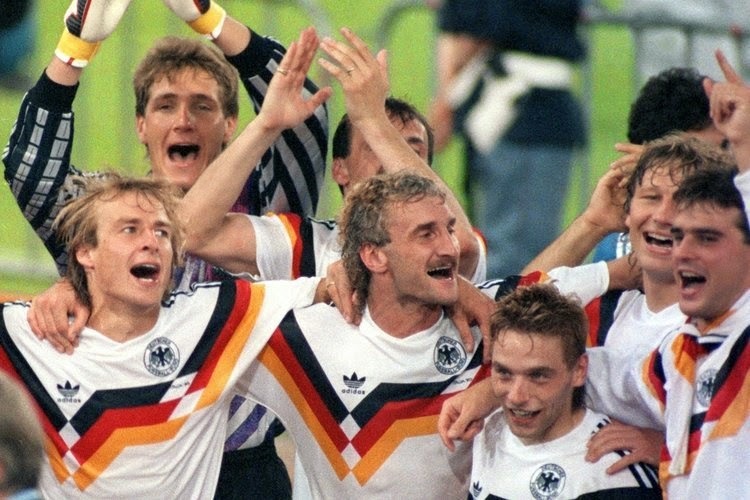 Scoring 4 times, Völler and his team qualified for the 1990 World Cup 1 point behind group leaders, the Netherlands. During the final tournament Völler would go on to score 3 goals, and although all three came in the group stages of the competition, West Germany would go on to win the World Cup title beating Argentina four years after they lost to that same team in the final in Mexico. In the round of 16 match against the Dutch, Völler got into an altercation with Frank Rijkaard which saw both players sent off in just the 22nd minute of the match. Völler would go on to miss the quarter-final match; the only match he did not start in the whole tournament. 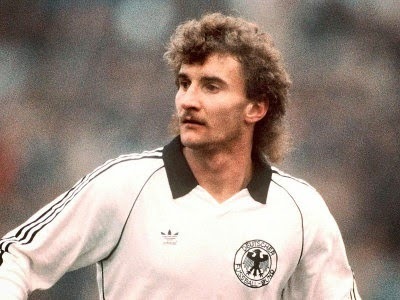 Rudi Völler would again be a part of the German squad for the 1994 World Cup in the United States. At the age of 34 Völler’s presence was mostly on the German bench, but he managed to score two more World Cup goals; both would prove to be crucial in a 3-2 round of 16 victory over Belgium. Germany were eliminated in the following round after a 2-1 loss to Bulgaria. Völler retired from professional football two years later, at the age of 36. Four years after that he was named manager for the German national team, and managed to lead his squad to the final match of the 2002 World Cup. 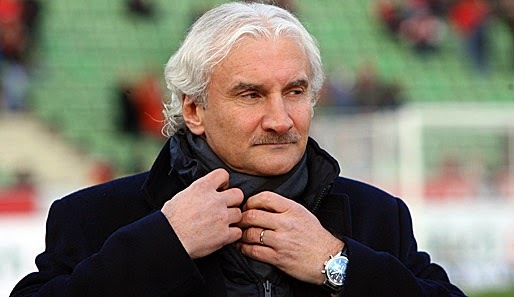 After a first round exit in the 2004 Euros, Völler resigned from his position. Along with fellow Franz Beckenbauer, Rudi Völler hold the title of losing in the World Cup finals both as a player and manager.